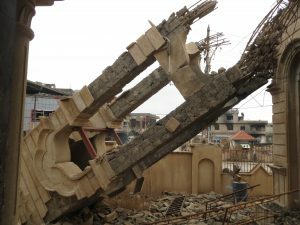 Christians who are now returning to their homes in areas of the Nineveh Plains liberated from the Islamic State’s control are finding chaos and destruction. After ISIS took control of the Nineveh Plain and other parts of Northern Iraq in 2014, thousands of Christians fled to Iraqi Kurdistan and lived in temporary housing that was usually unfit for the cold winter seasons. Many of these refugees had to rely on aid groups for their basic needs. “It’s a total mess… There was some hope to have a future… we feel that there’s no future left for the Christians. It’s kind of a sign for us, ‘you should leave, we’ve destroyed everything you have.’… We discovered so many of our documents and belongings at [our neighbor’s] places” said Diana. “Many residents still face the struggle of rebuilding their homes and villages, reconciling with their neighbors, and establishing security. It is a race against time to rebuild their homes before everyone chooses to leave Iraq, said Father Benham Benoka, president of the Humanitarian Nineveh Relief Organization with which Diana works. “So many families are leaving Iraq,” he told CNA. And the situation is even worse for those families who have left and are currently stranded in Lebanon, Turkey, and Jordan. When the United States toppled Saddam Husain the new government installed received no guidelines to write a new constitution. As a result, Sharia was made the supreme law just like in Iran. The Iraq constitutions states in Article 2, “No law that contradicts the established provisions of Islam may be established.” The same article establishes Islam as the “official religion.” There are no real guarantees of freedom of religion for Christians. After ISIS captured Mosul in June 2014, Christians from Qaraqosh, Mosul and other neighboring towns were given three choices: convert to Islam, pay a jizya tax, or die. By August of 2014, 50,000 people left Qaraqosh to seek asylum. Christians faced greater oppression today than under Saddam Hussain. This is why Christians fled from Bagdad north to the Nineveh Plains and Kurdish areas. It is in these areas that our Diapers for Refugees and Christmas for Refugees program is operating. A Christian refugee child poses with diapers at one of the seven different diaper delivery locations made possible through Diapers for Refugees. 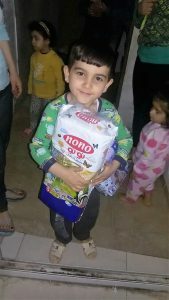 The Diapers for Refugees program aims to send high quality disposable diapers to these Christian refugee families located in camps around Erbil. Families in these camps are dying from diaper rash because of the inability to wash cloth diapers with soap and clean water. Due to the lack of diapers, mothers are forced to use donated clothing as diapers for their children, which still can’t be cleaned properly. With help from our donors, the Diapers for Refugees program gave nearly 300 families enough diapers to last for three months, totaling 160,000 diapers in the first shipment which took place in March 2016. In June of 2016, 160,000 more diapers were sent and distributed to families in the refugee camps located in Erbil. Our commitment for the remainder of 2016 is to provide these Christian refugee camps with diapers every three months, totaling 640,000 disposable diapers given to displaced Christian families. The price of a single shipment of diapers ranges from $18,000 to $20,000 or 11 cents per diaper. These shipments are distributed by large truckloads to Christian refugee camps across Northern Iraq. The Islamic State has declared war on Christianity too many times to count. Christianity is under attack and thousands of our Christian brothers and sisters are dying because of it. These Christian refugees need our continued prayers and support. Learn how you can help. Lebanon Event Three. About 100 children broek down into smaller groups. 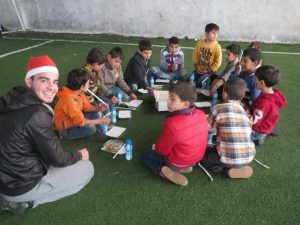 The Christmas for Refugees program helps displaced Christians from Iraq, Jordan and Lebanon that are being ignored by Islamic run charities. In 2013, 2014, Christmas events that included hot meals were served to Christian refugee children in Jordan and Lebanon. In 2015 the program was expanded to Christian IDP’s (Internally Displaced Persons) in Iraq who fled the Islamic State as the city of Mosul and Christians villages nearby were overrun. Much of the Nineveh Plain was also stolen from Christian families who fled to the Kurdish areas in the northeast. In 2016 the number of children served will be increased. Christmas for Refugees is much more than one hot meal at Christmas. The many hours long program includes a warm place to stay for a day with Gospel themed plays and puppet shows along with games and traditional Christmas songs. Gospel themed coloring books and work books are supplied to the children and in some cases Arabic language picture Bibles. Each child takes home a gift box for themselves and their family. The gift box for each child’s family varies by area, even within the same nation. The family gift is a box of essential items including toothbrushes, toothpaste, hand soap, tissues, sponges, feminine hygiene items as well as dish and laundry soaps. Learn how you can help.